The White Stripes placed second overall this year in their division in the Auckland competion, they have been playing for the past six years as part of Western Springs under the management and coaching of Geoff Brogan. Geoff Brogan is the grandson of Sir Albert Henry and grew up in Puaikura. He is passionate about football and wanted the opportunity for the White Stripes to see where he grew up. “The team is very excited to be here. Our aim is to win all our games, broaden the horizon’s of the girls using football as a vehicle. It is a multinational team with Kiwi’s, Moari, Fijian, Samoan, Scottish, Greek, French and Cook Islander ” said Brogan. For Brogan bringing the team home has been a goal and the team worked hard to fundraise for this tour. 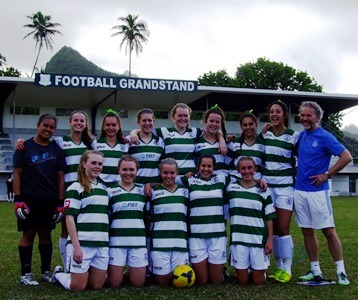 “The girls have done a lots of fundraising since February with BBQ sausage sizzles, raffles, movie nights to raise $5,000 for our Airfares, rental vehicles and with the kind sponsorship of Accommodation from CIFA we have been able do this tour” continued Brogan. “The team is a young team with players between the age of 14years to 18 years old. They are loving it and looking forward to playing their next two games. We are overwhelmed with the generosity and support from the community and hope to continue this as an annual event. We would like to work with CIFA on an exchange program and would love to host a team from the Cook Islands” stated Brogan. The White Stripes will play a Rarotonga Selection today at 5:00pm at the CIFA Complex.